We live in a very blustery part of the world and December is notoriously windy. World Wind Surfing Championships are often held here in December and do you know why? Well because quite literally you can pick your hairdo up two blocks away on any given day. And you all know how I love tin cans. So a great and easy craft, not to mention very gift-able craft for this very blustery time of year is a Tin Can Wind Chime. You will need a tin can and some sturdy string. 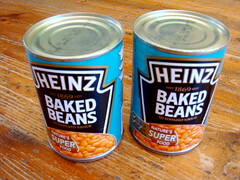 Step 1: Open the can with a tin opener and empty the contents. Make sure there are no sharp edges or if there are you can sand them down. Take the top right off the can and keep it. Step 2: Then paint your can and the lid all over. 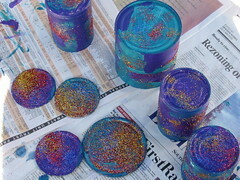 We used acrylic paints because they stick to tin cans. While your paint is wet generously sprinkle glitter everywhere. Wait for your paints to dry. One in the center of the base of the can. One to the side of the lid of the can. Step 4: Now you need to tie a strong knot in the end of your string (it will have to withstand a lot of blustering). 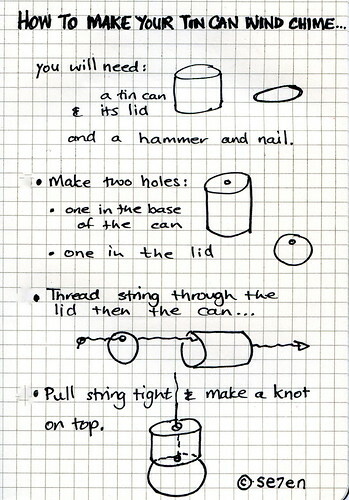 Step 5: Thread the string first through the hole in the loose lid of the can, and then up through the can itself. Step 6: Once you have threaded through and pulled it a bit tighter, then you need to tie a knot on top of the can. Step 7: Hang it in a blustery spot and let it clank away in the wind! Next Clearly Christmas: A Kids Christmas Craft Party in Se7en Steps. Hi Z, I am so glad you liked the chimes and that they worked out well for you! Fantastic!! !